My den tree filled with special ornaments from 1985 to the present! Got to have an aluminum tree! Complete with color wheel! Beautiful pictures and such a warm home filled with alot of love. Happy holidays. WOW!! lovely home. The link is working now. Thanks for joining! OMG are all those trees and old ornaments yours???? How amazing! I love the Barbie tree and retro ornaments. If I lived near you I'd beg you to sell some of those ornaments to me..hee,hee! I die on that Barbie tree! FABULOUS!!!! want. Wow, you have the most amazing vintage goodies, I just adore the vintage gift wrap and ornaments... it really does look like a country store! I knew Jessi would love the Barbie tree. I'm absolutely in AWE!! 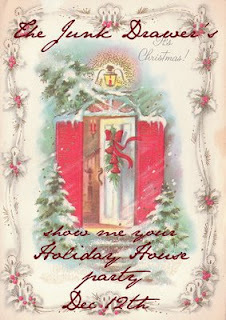 What a wonderful home you live in~I LOVE LOVE LOVE vintage Christmas!! Those large Santas are amazing, too! I don't know where to begin! LOVE it ALL! 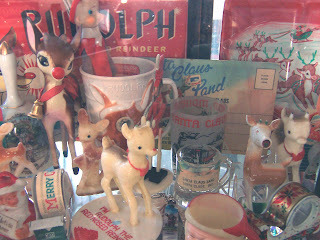 Love the vintage display case with the snow villages, the icicle and light boxes, every celluloid Santa, every store display, the books,the Rudolphs, the Hallmark, the Coca Cola, etc,etc! Thank you so much for sharing. I clicked on every picture! Merry Christmas! 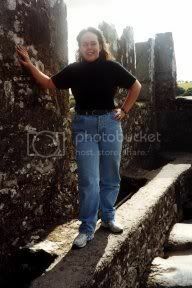 How is it that our blog paths have never crossed???? Oh my goodness. Love all your STUFF! Vintage goodies to DIE for - seriously! WOW! Greetings from Columbus, Ohio! Just wanted to thank your for sharing your amazing collection and wish you a very Merry Christmas! Oh my gosh! Your house is amazing. Where do you store all of your Christmas stuff during the off-season? I know we have a lot of Christmas stuff here that we have to store but it's nothing compared to your collections! This is simply amazing!! 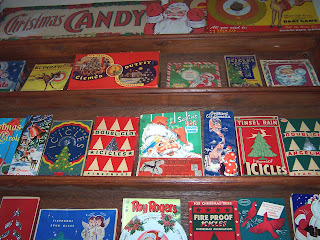 Wow, I am in love with all your vintage Christmas boxes....I collect Shiny Brite boxes! What can you tell me about the two big snowman "heads" on the bottom shelf of your snowman display? I'm not much of a snowman person, but those are soooooooOOOOooooo cute!!!! They are musical, that's about all I know!